P2CS – Think Positive, Think Pressure Control System! Do you want to push and pull the liquid on a chip or in a capillary gently? Do you want to stop the flow at the place where you can observe it in an optimal way? Do you want to be independent of the volume control at the microscopic scale? Then try the pressure-driven approach in microfluidics. 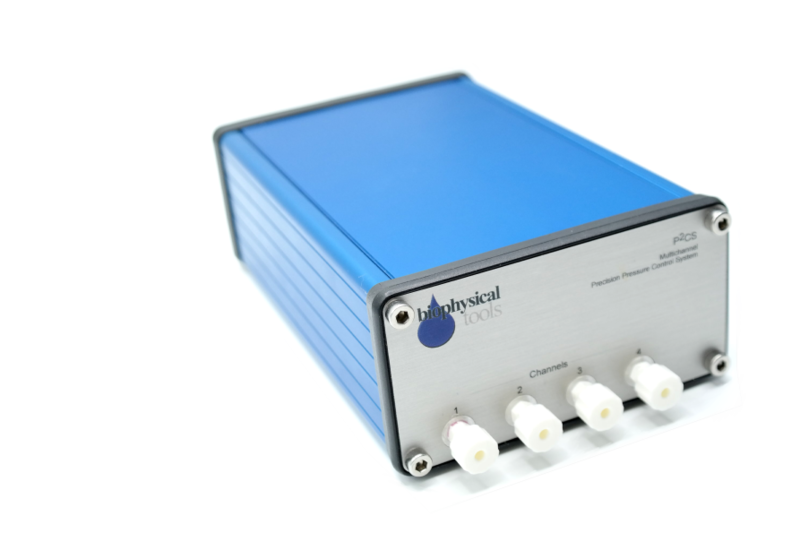 P2CS is designed for controlling pressure and, thus, the fluid flow in microfluidic experiments and microsystems. Standard version of the pressure control system achieves flow stabilization (100 mbar step) after 17 ms and is free of overshootings. P2CS Plus – New Thinking – New Pressure Control System! Pressure-driven control in microfluidic applications, e.g. lab-on-a-chip, organ-on-a-chip, point of care, but also capillaries or tubes. Droplet generation / droplet formation, e.g. in biphasic systems. Transportation of droplets, cells or other molecules on microfluidic chip or in capillaries. Implementation of the stop-flow or bidirectional flows in microfluidics. Experiments with low Reynolds numbers flows. Polymer and nanotube orientation on chips or in capillaries. Pressure-driven actuation of membranes and molecules. Dynamic perfusion during experiment (e.g. in electrophysiology). Pressure control system is equipped with pressure AND vacuum in each channel, which allows to stop flows as fast as starting them. No contact with fluids, no contamination, no cleaning is required. All liquids reside externally on-chip. No slowing down of the system dynamics at extremely low flow rates (at low Reynolds numbers). Standard version of the pressure control system achieves flow stabilization (100 mbar step) after 17 ms, the fall time is also 17 ms.
P2CS Plus achieves 100 mbar steps in 7 ms.
Pressure controller does not have overshooting or oscillatory settling. Pressure control system P2CS is controlled with plain-text commands which allows to integrate it in almost all software solutions as LabVIEW, MatLab, scilab, own developments. Pressure control system P2CS is real time (e.g. pulses have exactly the same length). Can the pressure control system be customized? We can flexibly adapt the software of the system and implement a number of individual adaptations of our microfluidic devices. Why are response, rise and falling times so important? Fast reaction of the pressure control system results in a more stable and constant flow, as small perturbations are compensated more swiftly. For example FACS, if you want to sweep cells through the channel, stop them in the focus of the observing microscope, take measurements and remove them and inject the next cell. You strongly accelerate the screening with high and low pressures. How can I characterize the transients of a dynamic system properly? Why is it arbitrary/not correct to characterize the system with the settling time? If you wish to change the flow speed you want to know how long this may take before the new value becomes „stable“. What does „stable“ mean? Maybe, once the measured value equals the desired value for the first or second time? This can easily be realized by tuning the system to be too „nervous“, i.e. with tendency to overshoot. This may be good for the sales manager but overshoots may perturb your experiment significantly. Furthermore, the settling time depends strongly on the tuning of the control loop and it is therefore quite arbitrary. The engineer may tune the settling time to any value when disregarding the overshoot dynamics. The ideal case would be that the observed quantity rises swiftly but smoothly until it reaches the new value and settles there. We could realize that with the pressure control system P2CS. Therefore we claim that the dynamics of P2CS relies uniquely on quantities as the compressibility of materials and air and the dead volumes of the valves and manifolds. Otherwise the system is optimal limited only by physical laws (causality). Now the problem is how to characterize the transition time in a well defined manner: theoretically speaking the settling time is infinite in this case and of no use. The solution is to characterize the pressure control system with the rise and fall time (see the next FAQ). How do we use rise/fall times to characterize the transient dynamics of the P2CS? First: What is rise and fall time? The P2CS lacks any overshoot and the flow increases/decreases until it reaches the desired value. Therefore we cannot define an error band. The rise/fall time, however, gives the delay between 10% and 90% of the pressure and flow speed difference. These values are fixed by convention. In physics 1/e is often used to characterize the time scale for the exponential approach to the final value. This time period can be obtained from the 10%-90% time perriod, or shortly 10%-value by t1/e = t10% / ln(10) (The numerical value of ln(10) ~2.3). In conventional designs being on the market you observe a damped oscillation before the object stabilizes its position in the microscopy image. This is a consequence of the classical control method called „PID“ (For more information about PID check this very instructive wikipedia page) and non-linear response function of the system. If you choose the PID-parameters too tight, overshoots appear. This is similar to a harmonic oscillator with a too small damping constant. If choosing the parameters so that the overshoot disappears, the system’s settling time becomes much more slowly – no choice to get around this limitation – its the law of physics! Therefore we developed a new control method, which removes such artifacts and improves strongly the response time, for rising as well as falling edges. As physicist I can say that this method presents the best possible allowed by hard physical laws (there is a hard limit because of a kind of uncertainty principle very similar to quantum mechanics). You will be surprised of the result because it gives a feeling as if you pushed the cells with your own fingers directly. Why do I need two pressure levels?